WHATEVER happened to the glib, unbeaten Tim Bradley? Fraudulent as his title-taking effort against Manny Pacquiao was, Bradley had always loomed a strong bet to land a return bout with the Filipino pound-for-pound boxing marvel. It was therefore not easy to believe that Bradley, the unbeaten world welterweight boxing title-holder, had never stood a solid chance of getting that rematch. Of course, it must first be explained here that, based on solid facts and honest scores (like the Compustats), Bradley should only be plainly called a title-holder, neither a champion nor a division king. 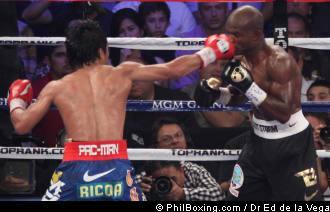 For Mr. Bradley’s elucidation, the WBO welterweight championship was never relinquished by Pacquiao. It was taken by the judges from Pacquiao before they gave it to the clear loser, thereby letting Bradley start his dubious rule. It’s like this: When three names--Juan Manuel Marquez, Miguel Cotto and Tim Bradley—were first raffled and shuffled off by Bob Arum’s Top Rank Promotions for Pacquiao’s next foe, Bradley did appear to own a fairly good chance of making it. The chances then slipped to slim. Next, there was practically none, with Bradley suddenly out of the picture. Plans for a Cotto-Pacquiao rematch never really took off, because the Porto Rican strongman would never again be caught draining himself to death just to meet Pacquiao at a very disadvantageous catch weight. For his part, Bradley first called Pacquiao scared. When this did not work, he practically went begging. Juan Manuel Marquez, meanwhile, hardly spoke a word. He just stuck to his claim that Pacquiao had never beaten him in all their three previous encounters. Of course, Dinamita had obviously also gotten tired chasing after the Pacman. But, just when he was ready to give up the ghost of ever having a Pacquiao-Marquez 4, the gods of pugilism smiled on Mexico. In fact, there were reports the fourth meeting between Pacquiao and Marquez could yet be staged in Mexico City. It could not however be confirmed if Bob Arum had already reserved a Dec. 8 fight date at the Las Vegas MGM Grand. Looking back, Bradley could only have his poor pay-per-view showing to blame. His one-sided scuffle with Pacquiao, (with the talkative American on the scared, cowering end) tallied only a little over 700, 000 buys. Pacquiao-Marquez III sold over 1.4 million subscriptions. Of course, it was not all about money. Although the Nevada State Athletic Commission did a moral job of ordering a review by a competent panel which next ruled Pacquiao had clearly beaten Bradley, the Nevada State Attorney General evidently messed up Bradley’s chances. The Attorney General reneged on its moral responsibility to the fight public by refusing to order the June 9 judges to at least explain and make clarifications on the strange scoring system they had adopted for the Pacquiao-Bradley fight. The system, which evidently scored Pacquiao misses in favor of his scared foe, was both immoral and absurd. Pacquiao has all the honest right to reject Bradley.